Mason County location is at MU’s Mid-Ohio Valley Center (One John Marshall Drive in Point Pleasant). For more details, the full press release is below. HUNTINGTON, W.Va. — The child may not remember, but the body remembers. 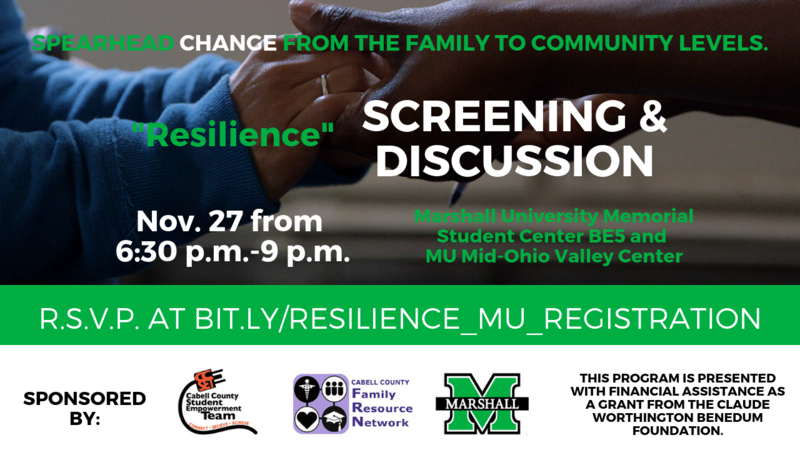 The Cabell County Family Resource Network (FRN), Cabell County Student Empowerment Team and Marshall University are hosting a screening of the film, “Resilience,” on Nov. 27. 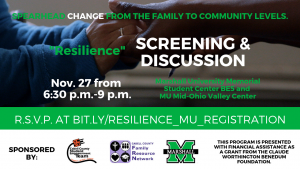 “Resilience” is a one-hour documentary that delves into the science of Adverse Childhood Experiences (ACES) and the birth of a new movement to treat and prevent toxic stress. Now understood to be one of the leading causes of everything from heart disease and cancer to substance abuse and depression, extremely stressful experiences in childhood can alter brain development and have lifelong effects on health and behavior. The film will be shown in Cabell and Mason Counties on Nov. 27 from 6:30 p.m. to 9 p.m. The Cabell County location is at Marshall University’s Memorial Student Center Room BE5 (One John Marshall Drive in Huntington). The Mason County location is at MU’s Mid-Ohio Valley Center (One John Marshall Drive in Point Pleasant). The event will start with the film and end with a discussion on how participants can implement strategies from the film in their own lives and communities. Registration is required. To quickly register for either location, R.S.V.P. at bit.ly/resilience_mu_registration. The registration deadline is Nov. 21. CEUs are available for WV social work licensure. According to the “Resilience” film website (kpjrfilms.co/resilience), researchers have recently discovered a dangerous biological syndrome caused by abuse and neglect during childhood. As the new documentary “Resilience” reveals, toxic stress can trigger hormones that wreak havoc on the brains and bodies of children, putting them at a greater risk for disease, homelessness, prison time, and early death. While the broader impacts of poverty worsen the risk, no segment of society is immune. “Resilience,” however, also chronicles the dawn of a movement that is determined to fight back. Trailblazers in pediatrics, education, and social welfare are using cutting-edge science and field-tested therapies to protect children from the insidious effects of toxic stress—and the dark legacy of a childhood that no child would choose. In September, the group presented the first ACES film screening of “Paper Tigers.” The “Resilience” film is the second in the series. This program is presented with financial assistance as a grant from the Claude Worthington Benedum Foundation. Learn more about the film at kpjrfilms.co/resilience. To learn more about the Cabell County Family Resource Network, visit www.cabellfrn.org.